NEW YORK -- So there we were on Christmas, a day full of expectations, an opening day full of promise for the NBA and for the NBA's New York team. NEW YORK — So there we were on Christmas, a day full of expectations, an opening day full of promise for the NBA and for the NBA’s New York team. Spike Lee was at courtside inside refurbished Madison Square Garden, of course, but so were Chris Rock, Alicia Keys, Tracy Morgan, Julianne Moore and a gaggle of celebrities. So, too, were Earl Monroe and Walt Frazier, glorious Knicks, glory-days Knicks. The Celtics were here, too, as the NBA, eager to recoup the losses sustained during its ugly lockout, squeezed a handful of games into the nation’s television sets. Celtics-Knicks, Mavs-Heat, Bulls-Lakers, Magic-Thunder, yeah, they were squeezed in juicier and tighter than the Christmas turkey and assorted sweets inside your beltline. The league was going great, as great as any time since Michael Jordan, until the lockout, and now we’ll see if it can regain that momentum. There will be 990 games squeezed into 124 days in a 66-game shortened season where a slew of teams rightfully figure they have a shot at the NBA Finals. On this day, nothing was going to top the hype of the Mavs hoisting their championship banner and LeBron & Co. promptly shredding them. Still, Celtics vs. Knicks was a tasty start. And by the time Kevin Garnett, angry he had missed a 14-foot jumper and his chance to tie the game at the buzzer, went at Bill Walker, you couldn’t help but feel we may have something special brewing here the next few seasons. “It’s going to be a rivalry now, because I think we can get up to the same level they are,” Knicks coach Mike D’Antoni said. “It’s going to be knock-down, drag-out. The Celtics were without Paul Pierce, who missed the opener with a bruised right heel, and Celtics fans can easily find enough points in Pierce’s game to claim he would have been the difference. And with Rajon Rondo, 31 points and 13 assists, continuing to run the ball down the Knicks’ throats as he did during last spring’s playoffs, those same Celtics fans also could argue we were seeing a lot of the same old, same old. But that’s the Celtics’ story, and the Celtics’ story will be much better told in the playoffs. Are they good enough to knock off the Heat and Bulls? Or have they finally gotten a step too old? We’ll see. One piece of welcome news Sunday was, with Big Baby Davis gone, Brandon Bass had 20 points and 11 rebounds in a beast of a Celtics debut. The Knicks are a different story. They added Melo and Amar’e Stoudemire last season. They added Tyson Chandler for this season. After years of desperation, last season was almost giddy. Just about everything the Knicks did was shiny and new. This year is different. They need to send messages fast and hard. D’Antoni knows it. The players do, too. There are serious expectations. Some folks even think they’ll overtake the Celtics for the division title. 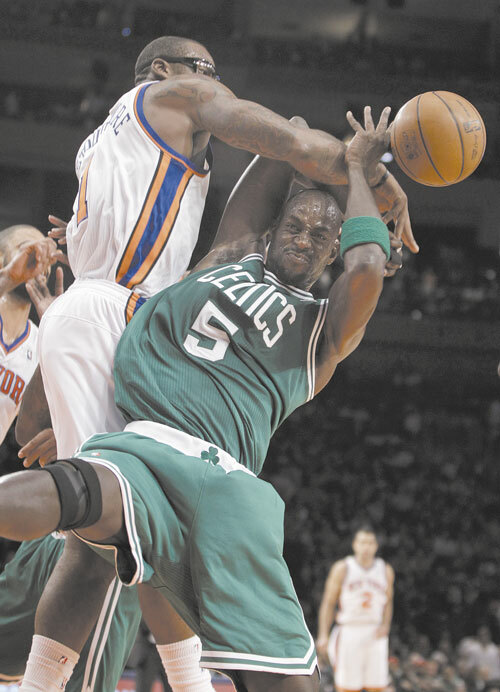 Afterward, Garnett said he saw some swag in the Knicks. He said, “Good for the city. Good for the Knicks.” Then he added, we’ll see how consistent they’ll be. Before the game, meeting with reporters, Pierce pointed out that optimism and reality are two different matters. But he conceded, yes, the Knicks do have talent. The Celtics beat them all eight times last year, including the playoff sweep. Early in the game, Anthony did his best to get his teammates going. The role of facilitator, he said, is something he has worked on during an abbreviated training camp. And it was something he thought about plenty through the lockout. The Celtics were awful in the first quarter. Doc Rivers joked that his team decided to join the 2011-2012 season after that. The Knicks were awful in the third quarter. D’Antoni called it a complete blackout. There was uneven play on both sides. There were bursts of brilliance followed by bursts of ineptitude, not surprising given the layoff. The Knicks also suffered injuries to Iman Shumpert (knee, two to four weeks) and Jared Jeffries (bruised calf). The Knicks struggled in the third after Melo went to the bench with his fourth foul. When he returned in the fourth quarter, well, his 17 points in those 12 minutes tell you all you need to know. So, was this evidence of a very good team coming together? Or just another opener where the energy in the building and an injury to the opponent’s most accomplished scorer led to the home team’s star saving the day? We’ll see. Unlike baseball, where we have to have a Quinnipiac poll to annually monitor the ebb and flow of the Red Sox and Yankee rivalry, the Celtics traditionally have had a stranglehold on central Connecticut. They played regular season games at the XL Center for years. When the Celtics stunk through the 1990s, the Knicks rose, with Hartford’s Marcus Camby, to fill a void. Yet there hasn’t been a good rivalry for many years, certainly nothing to get the old systolic and diastolic numbers jumping. “Well, this one was a dogfight,” Melo said. There were six technical fouls. There was lots of pushing and shoving. It came down to the last shot. Some of it had to be raw energy, players hungry to play for the first time since last spring. But this day also gave us a glimpse of what could be, a glimpse of something tasty for the 2012 Connecticut sports calendar.